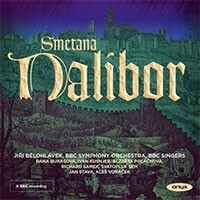 A treat here for Smetana fans. Dalibor, his most accomplished and successful opera after The Bartered Bride (though a wide margin separates them on both counts), contains some wonderful music, and while the dramaturgy is sometimes shaky, the musical experience holds up from beginning to end. This is the works first recording of modern times, and it does the opera full justice, with sensitive conducting, an excellent cast, and first-rate audio. Dalibor tells the story of a 15th century Czech knight, a national hero who took part in an uprising, for which he was sentenced to death. Most of the opera concerns his trail and incarceration, schemes to free him, and some peripheral love interest. So, plot-wise, it is basically a Czech Fidelio. Sonically, though, it has its own identity; there is a distinctively Czech flavour, and some memorable tunes, which are deployed with discretio. Dalibor himself has an elegant Leitmotif, a rising scale theme. There is a bracing march theme to introduce the pageantry and court scenes. And a plot device about a violin, which Dalibor hears in jail, occasions some elegant solos from the concertmaster. To paraphrase: This is the latest in a series of Czech opera concert performances from Bělohlávek, the BBC Symphony and a cast brought by the conductor from Prague. The cast is uniformly fine, and the success of the endeavour rests largely on the singer’s idiomatic performances and their obvious affinity with the music. But the British contingent is strong too. The BBC Singers are on fine form, especially the basses, who are regularly called upon to represent the judges and knights sitting in judgement over the hero. You wouldn’t mistake the BBC Symphony Orchestra for a Czech ensemble, but the Western qualities they bring to the music are just as valuable, not least the warm rich string tone and the rounded, clear brass. A few minor woodwind ensemble problems were apparent in the hall, and they can also be heard on the recording, but never to the point of distraction. The performance was described as a ‘concert staging’, but the action was minimal. There was an entry via the auditorium at one point I recall, and a dummy violin – the only prop. None of this has any bearing on the recording, which comes across as a straight concert rendition. One consequence is a slight lack of dramatic engagement; the work is performed with a symphonic breadth that distances it from the opera stage. That said, Jiří Bělohlávek really makes the most of the attention he can lavish on the music without the distraction of staging. And the sheer symphonic coherency of his reading is a redeeming virtue. All the marches sound regal, but never pompous, and the romantic music is always committed and sincere, elegantly shaped but disciplined too. The recording was made by the BBC and has been released on Onyx. The BBC’s sound here is excellent, and the engineers achieve a sense of warmth and involvement in the Barbican hall that has so far eluded the LSO Live engineers (although their most recent recording, Rattle’s Das Paradies und die Peri is their best yet sonically). There isn’t much opera in the Onyx catalogue, but the label has previously worked with the same conductor and orchestra on a Martinů symphony cycle that has been described by many as the best available, so continuing the collaboration seems wise. And this Dalibor is also the best on the market. Of the many recordings available, the most recent, to my knowledge, is the 1979 Smetáček version on Supraphon, which I reviewed when it was reissued in 2012. I wrote then that the opera was in desperate need of a good quality modern audio recording, and here it is. An easy recommendation.